Gutzmer: "I think that in the next 10 years 48-volt systems will account for the majority of hybrids." Schaeffler, together with Continental, has created a 48-volt hybrid prototype that can reduce CO2 emissions and fuel consumption in a compact car to less than 85 grams per kilometer. A variation of the mild hybrid system is already on the road in the new Renault Scenic minivan. 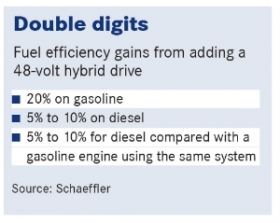 Schaeffler Chief Technology Officer Peter Gutzmer believes that 48-volt hybrids have the potential to become dominant players in Europe at the expense of diesel. 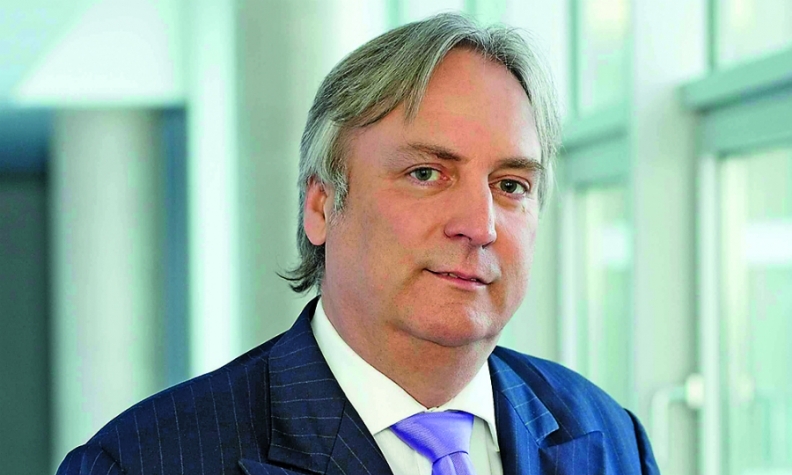 He explained why in an interview with Automotive News Europe Managing Editor Douglas A. Bolduc. What potential do you see for the 48-volt hybrid system? In our view, the future of the combustion-engine powertrain is 48-volt electrification combined with plug-in hybrid high-voltage solutions. The majority of automakers have to think about installing 48-volt hybrid drives. Because we need to meet the new CO2 fleet averages in Europe and other markets. To do that we need powertrains that can recuperate energy and we need to shut down the engine as often as possible if we don't need it for power. Main Challenge: Lowering the cost of the supplier's 48-volt hybrid drive by 10 percent to 20 percent. What kind of uptake do to you see for the technology? I think that in the next 10 years 48-volt systems will account for the majority of hybrids. I even think 48-volt systems will have the potential to extend or even replace what Toyota is very successfully doing [full hybrids such as the Prius without plug-in features]. There's only one question that needs to be answered: Can we finally reach our cost targets. We are not there yet. We are close but not there. Are you within 10 percent to 20 percent of your cost target? The Volkswagen Group's emissions-cheating scandal has hurt the diesel but has it also opened people's eyes to the potential for 48-volt hybrids to help reduce fuel consumption? Do you see the diesel losing significant market share in Europe? Two years ago, I was asked by customers whether a modern, optimized gasoline engine with a 48-volt hybrid drive could replace the diesel? I said, maybe. Today, I think there is really potential for the diesel to be replaced by 48-volt gasoline hybrid solutions in the future. They definitely will not completely replace diesels, but I am convinced they will, at least in some vehicle segments, replace them because diesels will be too costly [to produce because they will require more after-treatment systems to meet future emissions rules]. That's why we are in this part of the business. We see more potential for 48-volt hybrids on gasoline engines than for diesels. But we are also working on improving the diesel. The first 48-volt hybrid drive system that you have created with Continental is on the new Renault Scenic and Grand Scenic diesel. Why start with a diesel? You can also improve the diesel’s CO2 and other emissions with a 48-volt hybrid drive, but then you have two costly solutions together. A gasoline engine with a 48-volt hybrid could offer comparable or better CO2 results than a pure diesel drivetrain. Right now, your eMobility division accounts for about 5 percent of Schaeffler's automotive sales. What is the forecast for the future? Based on the expected increase of hybrid and pure battery-electric vehicles from 2020 onwards, we can easily imagine that our products in these vehicle types will account for 30 percent or more of our total automotive revenue by 2025.